A little authentic Mexican eatery with a simple menu: tacos, tacos and more tacos. At $3 a pop, it's easy to sample every flavour owner Vicky Ruiz has up her sleeve, from carne asada to chicken tinga. 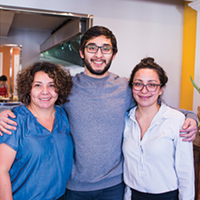 Life is but a dream for Vicky Ruiz, who opened her Mexican restaurant to a surge of hungry Haligonians.